Definition at line 72 of file treeview.c. Definition at line 86 of file treeview.c. Referenced by TREEVIEW_SetFont(), TREEVIEW_SetImageList(), and TREEVIEW_SetItemHeight(). Definition at line 122 of file treeview.c. Definition at line 123 of file treeview.c. Referenced by TREEVIEW_Command(), TREEVIEW_Edit_SubclassProc(), and TREEVIEW_EditLabel(). Definition at line 125 of file treeview.c. Referenced by get_notifycode(), TREEVIEW_BeginLabelEditNotify(), TREEVIEW_EndEditLabelNow(), TREEVIEW_GetUnicodeFormat(), TREEVIEW_NotifyFormat(), TREEVIEW_SendTreeviewNotify(), TREEVIEW_SetUnicodeFormat(), TREEVIEW_TVItemFromItem(), and TREEVIEW_UpdateDispInfo(). Definition at line 83 of file treeview.c. Referenced by TREEVIEW_DeleteItem(), TREEVIEW_InsertItemT(), TREEVIEW_Paint(), and TREEVIEW_SetRedraw(). Definition at line 81 of file treeview.c. Referenced by TREEVIEW_DrawItem(), and TREEVIEW_Refresh(). Definition at line 135 of file treeview.c. Definition at line 89 of file treeview.c. Referenced by TREEVIEW_Collapse(), TREEVIEW_GetVisibleCount(), TREEVIEW_Notify(), TREEVIEW_Refresh(), TREEVIEW_Size(), and TREEVIEW_UpdateScrollBars(). Definition at line 88 of file treeview.c. Referenced by TREEVIEW_Collapse(), TREEVIEW_Command(), TREEVIEW_ComputeItemRect(), TREEVIEW_EditLabel(), TREEVIEW_EnsureVisible(), TREEVIEW_Expand(), TREEVIEW_HScroll(), TREEVIEW_Notify(), TREEVIEW_Refresh(), TREEVIEW_Size(), and TREEVIEW_UpdateScrollBars(). Definition at line 108 of file treeview.c. Referenced by TREEVIEW_DrawItem(), TREEVIEW_DrawItemLines(), TREEVIEW_FillBkgnd(), TREEVIEW_GetBkColor(), TREEVIEW_SendCustomDrawNotify(), and TREEVIEW_SetBkColor(). Definition at line 111 of file treeview.c. Referenced by TREEVIEW_DrawItem(), TREEVIEW_GetInsertMarkColor(), and TREEVIEW_SetInsertMarkColor(). Definition at line 110 of file treeview.c. Referenced by TREEVIEW_DrawItemLines(), TREEVIEW_GetLineColor(), and TREEVIEW_SetLineColor(). Definition at line 109 of file treeview.c. Referenced by TREEVIEW_DrawItem(), TREEVIEW_DrawItemLines(), TREEVIEW_GetTextColor(), TREEVIEW_SendCustomDrawNotify(), and TREEVIEW_SetTextColor(). Definition at line 105 of file treeview.c. Definition at line 102 of file treeview.c. Referenced by TREEVIEW_DeleteItem(), TREEVIEW_DoSelectItem(), TREEVIEW_FreeItem(), TREEVIEW_GetNextItem(), TREEVIEW_LButtonDown(), and TREEVIEW_RButtonDown(). Definition at line 76 of file treeview.c. Referenced by TREEVIEW_ComputeItemInternalMetrics(), TREEVIEW_DrawItem(), TREEVIEW_DrawItemLines(), TREEVIEW_EditLabel(), TREEVIEW_EnsureVisible(), TREEVIEW_FontForItem(), TREEVIEW_HitTest(), TREEVIEW_InsertItemT(), TREEVIEW_IsFullRowSelect(), TREEVIEW_KeyDown(), TREEVIEW_LButtonDoubleClick(), TREEVIEW_LButtonDown(), TREEVIEW_MouseMove(), TREEVIEW_NaturalHeight(), TREEVIEW_Paint(), TREEVIEW_SetCursor(), TREEVIEW_SetItemHeight(), TREEVIEW_SingleExpand(), TREEVIEW_StyleChanged(), TREEVIEW_ToggleItemState(), and TREEVIEW_UpdateScrollBars(). Definition at line 98 of file treeview.c. Referenced by TREEVIEW_Command(), TREEVIEW_EditLabel(), and TREEVIEW_EndEditLabelNow(). Definition at line 100 of file treeview.c. Referenced by TREEVIEW_Collapse(), TREEVIEW_ComputeItemRect(), TREEVIEW_DeleteItem(), TREEVIEW_EnsureVisible(), TREEVIEW_Expand(), TREEVIEW_FreeItem(), TREEVIEW_GetNextItem(), TREEVIEW_HitTestPoint(), TREEVIEW_InsertItemT(), TREEVIEW_MouseWheel(), TREEVIEW_SetFirstVisible(), TREEVIEW_SetFocus(), TREEVIEW_Size(), TREEVIEW_Sort(), TREEVIEW_UpdateScrollBars(), and TREEVIEW_VScroll(). Definition at line 97 of file treeview.c. Referenced by TREEVIEW_DoSelectItem(), TREEVIEW_DrawItem(), TREEVIEW_FreeItem(), TREEVIEW_LButtonDown(), and TREEVIEW_RButtonDown(). Definition at line 114 of file treeview.c. Referenced by TREEVIEW_Destroy(), TREEVIEW_FontForItem(), and TREEVIEW_SetFont(). Definition at line 116 of file treeview.c. Definition at line 117 of file treeview.c. Definition at line 113 of file treeview.c. Referenced by TREEVIEW_Destroy(), and TREEVIEW_SetFont(). Definition at line 112 of file treeview.c. Referenced by TREEVIEW_CreateDragImage(), TREEVIEW_EditLabel(), TREEVIEW_FontForItem(), TREEVIEW_GetFont(), TREEVIEW_NaturalHeight(), TREEVIEW_SetFont(), and TREEVIEW_UpdateSubTree(). Definition at line 126 of file treeview.c. Referenced by TREEVIEW_CreateDragImage(), TREEVIEW_DrawItem(), TREEVIEW_GetImageList(), and TREEVIEW_SetImageList(). Definition at line 129 of file treeview.c. Referenced by TREEVIEW_DrawItem(), TREEVIEW_GetImageList(), TREEVIEW_InitCheckboxes(), TREEVIEW_Paint(), and TREEVIEW_SetImageList(). Definition at line 96 of file treeview.c. Referenced by TREEVIEW_DrawItem(), TREEVIEW_FontForItem(), TREEVIEW_FreeItem(), TREEVIEW_MouseLeave(), TREEVIEW_MouseMove(), and TREEVIEW_SendCustomDrawItemNotify(). Definition at line 115 of file treeview.c. Definition at line 74 of file treeview.c. Referenced by TREEVIEW_Collapse(), TREEVIEW_Command(), TREEVIEW_ComputeTextWidth(), TREEVIEW_Destroy(), TREEVIEW_DrawItem(), TREEVIEW_DrawItemLines(), TREEVIEW_EditLabel(), TREEVIEW_EnsureVisible(), TREEVIEW_EraseBackground(), TREEVIEW_Expand(), TREEVIEW_HandleTimer(), TREEVIEW_HitTest(), TREEVIEW_HScroll(), TREEVIEW_Invalidate(), TREEVIEW_InvalidateItem(), TREEVIEW_KillFocus(), TREEVIEW_LButtonDoubleClick(), TREEVIEW_LButtonDown(), TREEVIEW_MouseMove(), TREEVIEW_MouseWheel(), TREEVIEW_NCPaint(), TREEVIEW_Notify(), TREEVIEW_NotifyFormat(), TREEVIEW_Paint(), TREEVIEW_PrintClient(), TREEVIEW_RButtonDown(), TREEVIEW_Refresh(), TREEVIEW_SendRealNotify(), TREEVIEW_SetCursor(), TREEVIEW_SetFirstVisible(), TREEVIEW_StyleChanged(), TREEVIEW_ThemeChanged(), TREEVIEW_TrackMouse(), TREEVIEW_UpdateScrollBars(), TREEVIEW_UpdateSubTree(), TREEVIEW_VScroll(), and TREEVIEW_WindowProc(). Definition at line 120 of file treeview.c. Referenced by TREEVIEW_Command(), TREEVIEW_Destroy(), TREEVIEW_DrawItem(), TREEVIEW_EditLabel(), TREEVIEW_EndEditLabelNow(), TREEVIEW_GetEditControl(), TREEVIEW_LButtonDown(), TREEVIEW_RButtonDown(), TREEVIEW_SingleExpand(), and TREEVIEW_WindowProc(). Definition at line 75 of file treeview.c. Referenced by TREEVIEW_Command(), TREEVIEW_RButtonDown(), and TREEVIEW_SendRealNotify(). Definition at line 118 of file treeview.c. Referenced by TREEVIEW_Destroy(), TREEVIEW_GetToolTips(), TREEVIEW_SetToolTips(), and TREEVIEW_StyleChanged(). Definition at line 104 of file treeview.c. Referenced by TREEVIEW_DrawItem(), and TREEVIEW_SetInsertMark(). Definition at line 103 of file treeview.c. Referenced by TREEVIEW_DeleteItem(), TREEVIEW_DrawItem(), TREEVIEW_FreeItem(), and TREEVIEW_SetInsertMark(). Definition at line 132 of file treeview.c. Referenced by TREEVIEW_AllocateItem(), TREEVIEW_Destroy(), TREEVIEW_FreeItem(), TREEVIEW_GetItemIndex(), TREEVIEW_SetFont(), and TREEVIEW_VerifyItem(). Definition at line 134 of file treeview.c. Definition at line 101 of file treeview.c. Referenced by TREEVIEW_MouseWheel(), TREEVIEW_RecalculateVisibleOrder(), TREEVIEW_SetFirstVisible(), and TREEVIEW_UpdateScrollBars(). Definition at line 127 of file treeview.c. Referenced by TREEVIEW_DrawItem(), TREEVIEW_NaturalHeight(), and TREEVIEW_SetImageList(). Definition at line 128 of file treeview.c. Referenced by TREEVIEW_ComputeItemInternalMetrics(), and TREEVIEW_SetImageList(). Definition at line 136 of file treeview.c. Definition at line 77 of file treeview.c. 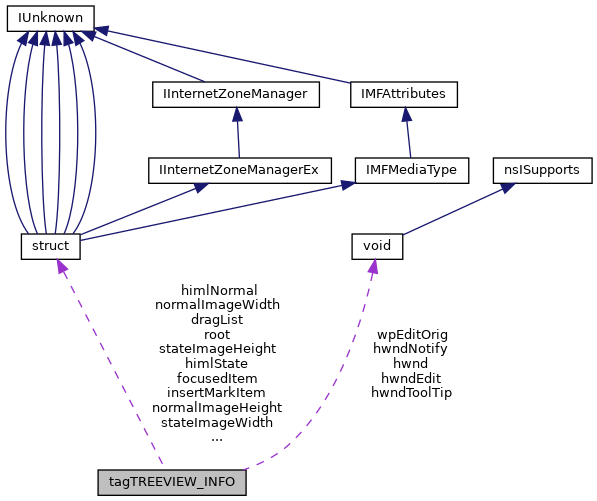 Referenced by TREEVIEW_DeleteItem(), TREEVIEW_Destroy(), TREEVIEW_DrawItemLines(), TREEVIEW_EnsureVisible(), TREEVIEW_GetLastListItem(), TREEVIEW_GetNextItem(), TREEVIEW_GetPrevListItem(), TREEVIEW_HScroll(), TREEVIEW_InsertItemT(), TREEVIEW_KeyDown(), TREEVIEW_Paint(), TREEVIEW_ProcessLetterKeys(), TREEVIEW_RecalculateVisibleOrder(), TREEVIEW_Refresh(), TREEVIEW_RemoveTree(), TREEVIEW_SetFirstVisible(), TREEVIEW_SetFont(), TREEVIEW_SetImageList(), TREEVIEW_SetIndent(), TREEVIEW_SetRedraw(), TREEVIEW_Sort(), TREEVIEW_StyleChanged(), TREEVIEW_UpdateScrollBars(), TREEVIEW_VerifyRoot(), and TREEVIEW_VScroll(). Definition at line 106 of file treeview.c. Referenced by TREEVIEW_ComputeItemInternalMetrics(), TREEVIEW_EnsureVisible(), TREEVIEW_HScroll(), and TREEVIEW_UpdateScrollBars(). Definition at line 95 of file treeview.c. Referenced by TREEVIEW_Collapse(), TREEVIEW_DeleteItem(), TREEVIEW_DoSelectItem(), TREEVIEW_DrawItem(), TREEVIEW_FreeItem(), TREEVIEW_GetNextItem(), TREEVIEW_HandleTimer(), TREEVIEW_KeyDown(), TREEVIEW_KillFocus(), TREEVIEW_LButtonDown(), TREEVIEW_ProcessLetterKeys(), TREEVIEW_RButtonDown(), TREEVIEW_SelectItem(), TREEVIEW_SendCustomDrawItemNotify(), and TREEVIEW_SetFocus(). Definition at line 130 of file treeview.c. Referenced by TREEVIEW_DrawItem(), TREEVIEW_InitCheckboxes(), and TREEVIEW_SetImageList(). Definition at line 131 of file treeview.c. Referenced by TREEVIEW_ComputeItemInternalMetrics(), TREEVIEW_InitCheckboxes(), and TREEVIEW_SetImageList(). Definition at line 137 of file treeview.c. Definition at line 79 of file treeview.c. Referenced by TREEVIEW_HandleTimer(), TREEVIEW_LButtonDoubleClick(), and TREEVIEW_LButtonDown(). Definition at line 92 of file treeview.c. Referenced by TREEVIEW_Expand(), TREEVIEW_Notify(), and TREEVIEW_UpdateScrollBars(). Definition at line 91 of file treeview.c. Referenced by TREEVIEW_HScroll(), TREEVIEW_Notify(), and TREEVIEW_UpdateScrollBars(). Definition at line 94 of file treeview.c. Referenced by TREEVIEW_ComputeItemInternalMetrics(), TREEVIEW_GetIndent(), TREEVIEW_LButtonDoubleClick(), TREEVIEW_SetImageList(), and TREEVIEW_SetIndent(). Definition at line 78 of file treeview.c. Referenced by TREEVIEW_HScroll(), TREEVIEW_UpdateScrollBars(), and TREEVIEW_VScroll(). Definition at line 85 of file treeview.c. Referenced by TREEVIEW_ComputeItemRect(), TREEVIEW_GetItemHeight(), TREEVIEW_GetVisibleCount(), TREEVIEW_HitTestPoint(), TREEVIEW_HScroll(), TREEVIEW_SetFirstVisible(), TREEVIEW_SetFont(), TREEVIEW_SetImageList(), and TREEVIEW_SetItemHeight(). Definition at line 80 of file treeview.c. Referenced by TREEVIEW_GetCount(), TREEVIEW_InsertItemT(), TREEVIEW_RemoveItem(), and TREEVIEW_RemoveTree(). Definition at line 82 of file treeview.c. Referenced by TREEVIEW_GetScrollTime(), and TREEVIEW_SetScrollTime(). Definition at line 107 of file treeview.c. Definition at line 121 of file treeview.c. Referenced by TREEVIEW_Destroy(), TREEVIEW_Edit_SubclassProc(), and TREEVIEW_EditLabel().